NEW ORLEANS – South Plains’ men led the NJCAA Division I rankings for the fifth straight week, while the SPC women held on as No. 1 for the third straight week. The U.S. Track & Field and Cross Country Coaches Association (USTFCCCA) released the computer team rankings on Wednesday. The top three men’s teams remained over a hundred ranking points clear of the rest of the nation. No. 2 Central Arizona and No. 3 Iowa Central reprised those rankings for the fourth straight week. Behind them, No. 4 Barton County leapfrogged No. 5 Iowa Western and No. 6 Coffeyville; Nos. 7 and 8 Western Texas and Monroe passed Nos. 9 and 10 Mesa and Cloud County. Two men’s squads joined the top twenty-five this week: No. 22 Essex County (N.J.) and No. 25 Lincoln (Ill.). The latter is ranked in the top twenty-five for the first time indoors or out this year after climbing eighteen rungs on the ladder. All of the women’s top ten returned from a week ago. Nos. 3-5 New Mexico, Coffeyville, and Central Arizona switched spots, while No. 2 Iowa Central, No. 6 Iowa Western, No. 7 Barton County, No. 8 North Iowa Area, No. 9 Western Texas, and No. 10 Vincennes stayed in the same slots. One women’s team entered the rankings this week. No. 24 Macomb moved up from No. 29 and replaced Garden City in the top twenty-five. All eight regional No. 1 teams from last week maintained that ranking this week. 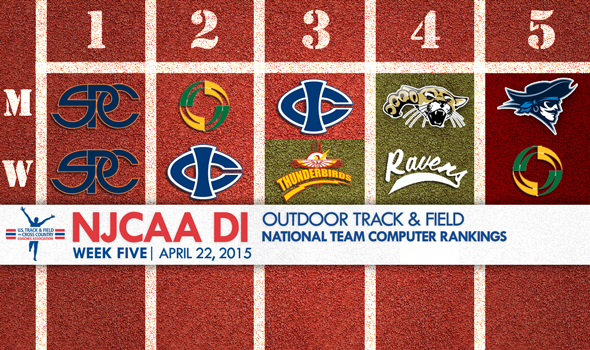 The NJCAA Division I rankings will be released every Wednesday between now and outdoor nationals.